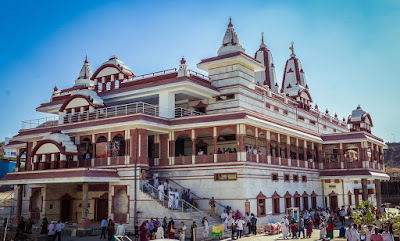 ISKCON Temple is a very peaceful place in patna.ISKCON Temple Patna is magnificent spiritual center is situated on the Buddha marg.ISKCON Temple is Known as Sri Sri Radha Banke Bihari Ji Mandir.The temple has been started by International Society for Krishna Consciousness (ISKCON). Here is some fact about ISKCON Temple Known as Sri Sri Radha Banke Bihari Ji Mandir in Patna Bihar India. How to Reach by Air: The nearest Airport is Patna Airport just 6 KM of Temple. How to Reach by Rail:The nearest Railway station is Patna city Railway station. ISKCON Temple is located at Golok Dham, Bhuddha Marg in Patna the capital of Bihar.The temple was built started in 2007 and is expected to be completed by 2017 and built by International Society for Krishna Consciousness (ISKCON). The temple is dedicated three deities, namely, Sri Sri Gaur Nitai, Sri Sri Radha Banke Bihari Ji and Sri Sri Ram Durbar. The temple complex will come up in an area of 2 acres. It will comprise mediation and spiritual centre, restaurant, medical consultancy centre, community kitchen, guesthouse and an auditorium besides the two-storey main structure. The structure will have a central dome and three darbar or halls on the top floor where deities will be placed. The first hall, Radha Banke Bihari Ji Darbar, will consist of idols of Lord Krishna and Radha along with Lalita and Vishakha. 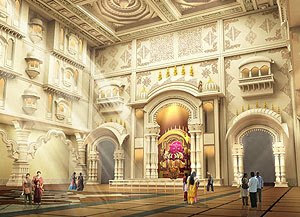 The second hall, Ram Darbar, will have the idols of Lord Rama with Sita, Lakshman and Hanuman. 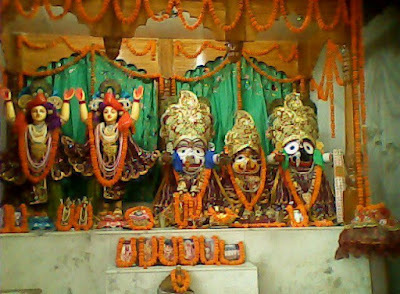 The third hall, Gaur Nitai Darbar, will have the idol of Chaitanya Mahaprabhu and Nityanand Mahaprabhu. The idols measuring nearly 3-feet will be placed on 24-carat gold plated thrones. The total cost estimated is Rs 51 crore. The auditorium will have the capacity of 1500 persons, to be leased for spiritual programmes. The restaurant will serve the vegetarian food at reasonable prices and will be open for general public. The guesthouse would have 60 rooms, including both AC and non-AC rooms for members of ISKCON, while the auditorium would have the seating capacity of 1,500 persons. It would be given on rent for spiritual programmes. The temple will also have an Ayurvedic research center providing medical consultancy and treatment through Ayurveda, homeopathy and nephropathy. 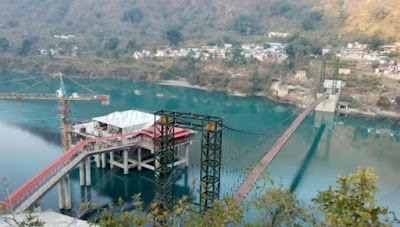 Dhari Devi temple situated at Dang Chaura on Srinagar-Rudraprayag road lies in Rudraprayag district and is only few kilometers from Pauri Garhwal district in Dev Bhoomi Uttarakhand state in India. 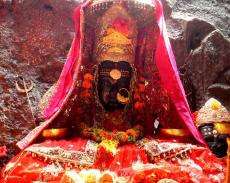 Sitting on the bank of Alakhnanda river, Dhari Devi temple is believed to protect the tirtha yatri (pilgrims) of Char Dham.Here is some fact about Dhari Devi Temple Near Srinagar Gadhval in Uttarakhand India. How to Reach by Air: Te Nearest Airport is Jolly Grant Airport Dehradun. (136 KM). How to Reach by Rail:The Nearest Railway station is Rishikesh Railway station.(122KM). How to Reach by Road: There are many public and private vehicals available to reach here. Dhari Devi Temple is located at Dang Chaura on Srinagar-Rudraprayag road lies in Rudraprayag district and is only few kilometers from Pauri Garhwal district in Uttarakhand.The temple is situated on the banks of river Alaknada.The temple was built in about 2500 years ago.The temple is dedicated to Goddess Kali.The Dhari Devi temple in Shrinagar is one of the famous religious sites en route to Rudraprayag.As per local lore, Dhari Devi changes in appearance during the day from a girl, to a woman, and then to an old lady. Only a visit to both the temples makes the darshan of the Goddess complete.The upper half of an idol of a deity came flowing down along the Alaknanda river and settled here. Since then the idol is worshiped here in the form of Goddess Dhari. The Goddess is believed to change appearance during the day. Local legend on Dhari Devi states that once there was a huge flood in Alakhananda river which swap away many properties. After the flood, locals heard a woman crying in the river site. When they reached the bank of Alakhananda, they saw the upper half of an idol of goddess Kali attached against a rock in Alakhananda river and they heard an instruction that the goddess wants to be installed at the very place as she is under the open sky. 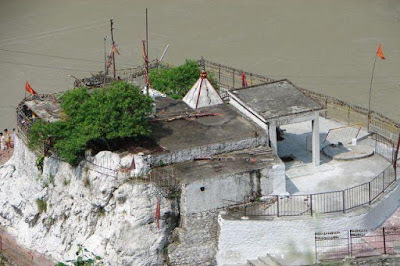 Locals followed the instructions and established Dhari Devi temple in the small island in Alakhnanda river few kilometers below Kaliya Saur in Srinagar-Rudraprayag road. The temple now has been raised from it's original position in the middle of the river due to the construction of the Hydro Power Plant. One has to go downhill from the road. The path to the temple decorated with numerous bells and give very divine feeling. Inside the temple one can perform pooja with the help from the local pundits. A large number of devotees visit the temple throughout the year. Out of the many festivals celebrated in Dhari Devi Temple, the important festivals are Durga Puja and Navratri, when a special Puja is organized in the temple. The temple is decorated with beautiful flowers and light. 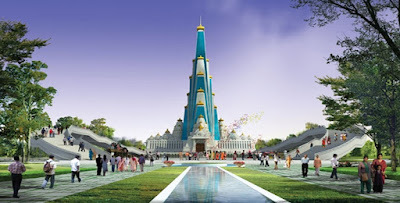 ISKCON(The International Society for Krishna Consciousness) is doing the ground breaking ceremony at Mathura, the birth place of Lord Krishna, to build the world's tallest temple.The temple site is strategically located on Bhaktivedanta Swami Marg-formerly called Chhatikara Road, which is the main access to Vrindavan on the Delhi-Agra Highway. Here is some fact about World's tallest Temple Vrindavan Chandrodaya Mandir in Vrindavan near Mathura Uttar Pradesh India. How to Reach by Road: There are a small number of direct buses that ply between Delhi and Vrindavan.you can board the Mathura bus, get down at Chatikara Road and then take a motor-rickshaw or a tempo to reach Vrindavan. 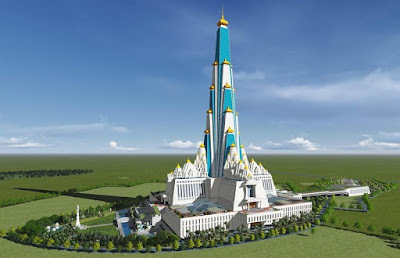 The Chandrodaya Temple being built in Vrindavan is a tall order.The Vrindavan Chadrodaya Mandir will be the world’s tallest temple. At 700ft, the temple will be three times the height of Delhi’s Qutub Minar. 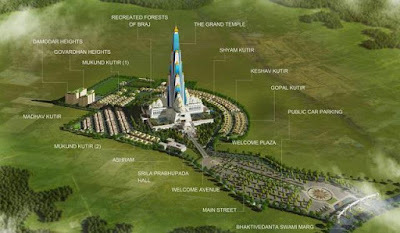 The temple is dedicated to Radhe Krishna.The Skyscraper temple project will include Vrindavan Chandrodaya Mandir, a Temple with a height of 210 meters (70 stories) and footprint of about 5 acres, surrounded by the recreated forests of Braj conceived by the devotees of ISKCON-Bangalore.The temple is planned to be vibrant with festivals and religious activities throughout the year. An indoor Krishna-Radha recreational park. Canteen for food and drinks. Varieties of housing and accommodation are available the visitors to stay for a few days. Next time, when you are in Vrindavan, you must check out the Vrindavan Chandrodaya Mandir.Now a days temple is under contractions. Other information will be update soon.Visit this website. 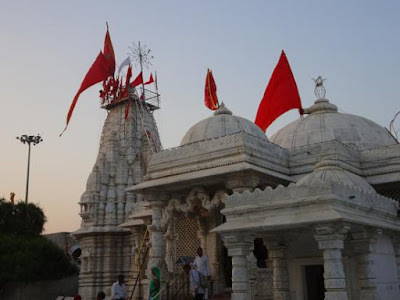 Shankhalpur village is near Becharaji Bahuchar Ma Temple in Maheshana District , which is 110 KM of Ahmadabad Gujarat.In Shankhalpur very popular Goddess Bahuchar temple.Shankhalpur is birth place of Goddess Bahuchar.Here is some fact about Bahuchar Maa Temple at Sankhalpur in Gujarat India. How to reach by Air: The Nearest Airport is Ahmadabad Airport.(110KM). How to reach by Rail: The Nearest Railway station is Becharaji station.(2KM). How to Reach by Road : There are many public and private vehicles available to reach here. Bahuchar Ma temple is located near Becharaji in Maheshana district in Gujarat India.In Shankhalpur Bahuchar Ma is known as Toda Ma.The temple was built about 5200 years ago.Now a days the temple is renovate. The temple is nicely decorated with stone carving. Every year 1.5 million pilgrims visit this temple .Navratri festival is celebrated every year in this temple.The temple is very beautiful. 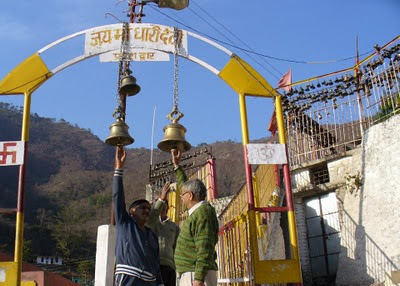 The temple has Dharamshala and Bhojanshala.Temple Trust Provide nominal rates Food and Accommodation in Dharamshala. 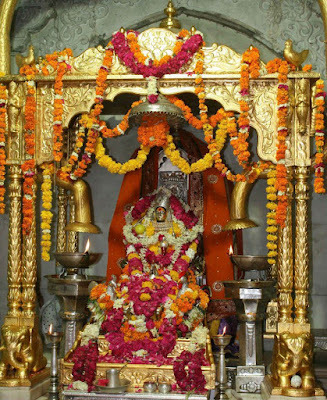 During Navratri and Durgashtamio special puja and Havan arrange by temple trust.Large numbers of devotes take part this festival.Anand no Garbo the famous Garba song is also dedicated to this place.